On November 22 – 25th, 1,270 exhibitors from 47 countries will make their way to Paris, France to show off their products. GreenDustries Packaging will be there with both the PleatPak and MagicBag to showcase 2010’s Performance Innovation Packaging. 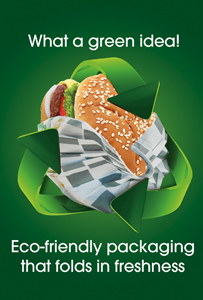 Emballage believes that innovation, sustainable development and design optimize the effectiveness of packaging, a product’s identity and a brand’s image. 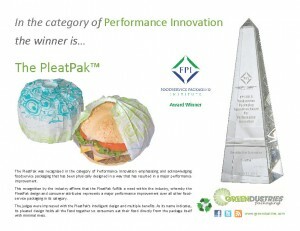 The purpose of this Packaging show is to showcase the world’s latest and greatest when it comes to packaging. At our tradeshow booth, visitors can experience our one of a kind, pleated technology. We will have product samples as well as information regarding our packaging. Our smart packaging concept mixed with 100% traceable recycled paper from our Paper Mill will be showcased among the near 300 new products at the show. Bringing tomorrow’s packaging concept to today. If you will be at the show, stop by and visit our booth, for our online community we will bring you back pictures of this great event. Only close the sound! The CNN video about our products is to important… Thank you! Hi Rudy! Did you visit our website? http://www.greendustries.com? Full of info…. Thank you! Hi Andrea, we love Texas @ GreenDustries! We also love your post…. Thank you! Hi Matha! Did you visit our website? http://www.greendustries.com? More info there… Thank you! I think there’s a problem with the RSS feed here. Appears to be a missing link to me? Hi Mania, good for you! We wishes you good luck! Thank you. Hi Dugald, http://www.greendustriesblog.com is the place to go for more to read….www.greendustries.com for more info…Thank you. Hi Mary, we are exhibiting an other time in New York, @ the Jarvis Convention Center – March 4-6, 2012. Come see us! http://www.greendustries.com.Thank you. Hi Corrine, everything is OK, on our side… Thank you! I would like to thnkx for the efforts you have put in writing this web site. I’m hoping the same high-grade site post from you in the future also. In fact your creative writing abilities has encouraged me to get my own site going now. Actually blogging is spreading its wings and growing quickly. Your write up is a great example.